It has a fast interface. It gives daily prices and occupancies for each room as well as the total price. 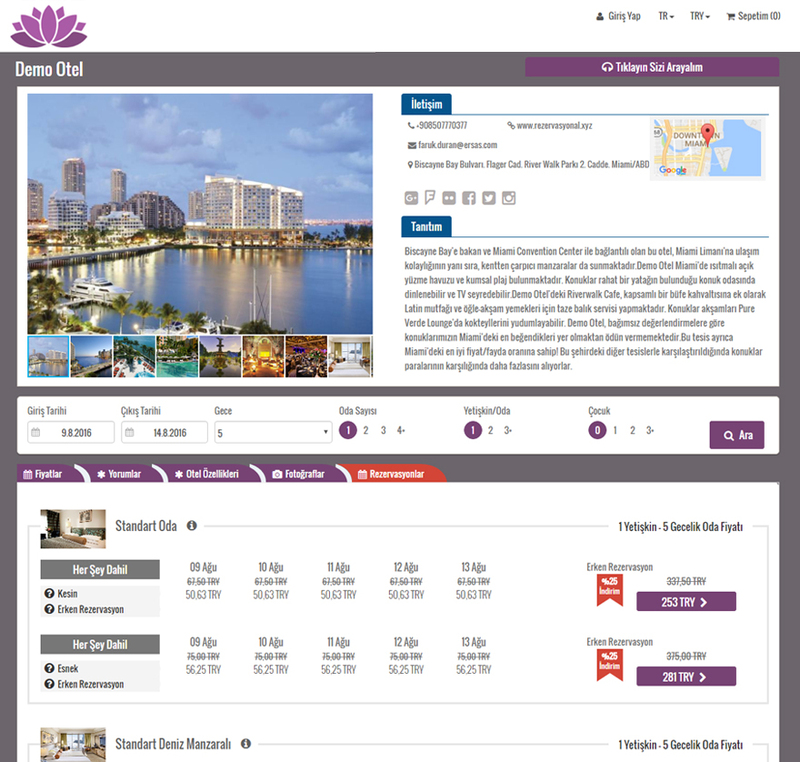 It shows prices with the discount rates as normal or discount. It also lists different prices and discounts for the same room. Can make reservations with a single step. Can make multiple reservations for different dates and room types at the same time. It offers a variety of payment options. It recognizes Credit Card, uses points, makes installments. When the reservation is made, it makes the notification by SMS and e-mail. It offers flight and transfer options. You can select what you want from unlimited language and currency options. Address and identity such as informations can be customized by the hotel. Thanks to online chat, click to call and call me form, be in contact with customers during booking. It notifies the demand to the hotel with SMS. It makes instant notification to hotel with SMS upon completion of reservation. It provides links to your social media pages. It provides directions via Google Maps. Thanks to its responsive structure, it gives access to all devices. Instead of a list, option tabs are designed to be easily used on mobile devices. You can see the best comments on your online booking page. You can create additional pages or factsheets. You can do promotions. It creates automated pop-up screens. Management of Extranet is very easy and practical. You can quickly sign up to start your sales. You can use a combination of contract and daily pricing. With the contracts, you will access a lot of features which you cannot do by using the online booking system. For example, you can give different prices for different reservation dates. The prices of reservation can be controlled retroactively. You can enter daily prices for the desired dates. You can define discounts on the features that you want. For example, 15% discount for bookings which made before 60 days or 50% discount for daily reservation that are made after 10:00 PM. You can create special promotional codes for your customers. These promotions can be used by each customer, as well as used in general. Can distributed with e-mail or advertising. You can define your specific price and method of payment for your agencies and corporations. You can send them the password to login. So, you will have the chance to make reservations 24/7 for many agencies without asking about availability and the price. According to IP you can give different prices to the different markets. You decide how many markets you create and which countries to include in these markets. If you want, you can close room types or all your sales to some markets. With the online booking page you set up on your Facebook, you can receive reservations on social media. You can Access the Google analytics about your page and also you can get analytics support from our certificated professionals. It provides a lot of forms of search alternatives in order to put on the main page of your website. Sayfanızda 40'a yakın dil desteklenmektedir; sayfanızda aktif olmasını istediklerinizi belirtebilir, önyüzde sadece bu seçeneklerin gelmesini sağlayabilirsiniz. Sayfanızdaki fiyatları dünyada tanımlı 89 para biriminden otomatik kur çevrimi ile gösterebilirsiniz. Kurlar Türkiye’ deki otellerimiz için TC Merkez Bankası Alış Kurunda çevrilmektedir. Kullanım kolaylığı açısından hedeflediğiniz markete ait birkaç para birimi seçmenizi tavsiye ederiz.